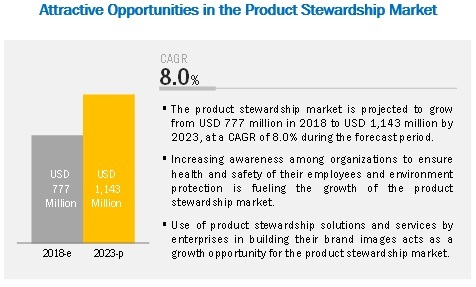 [118 Pages Report]The product stewardship market is projected to grow from USD 777 million in 2018 to USD 1,143 million by 2023, at a Compound Annual Growth Rate (CAGR) of 8.0% from 2018 to 2023. The major factors driving the growth of the market are growing awareness among organizations to ensure health and safety of their employees and environment protection, increasing requirement of enterprises to publicize their environmental, health, and safety initiatives, and complying with various environmental regulations and government guidelines. 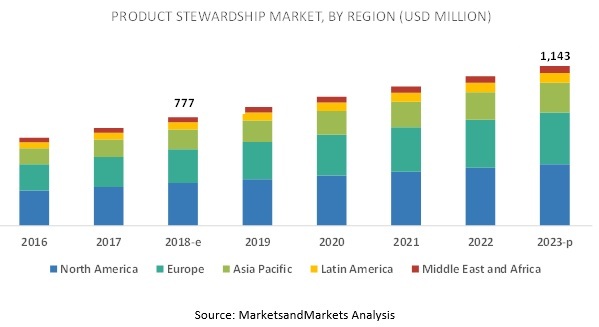 Based on Type, services segment of the product stewardship market is projected to grow at the highest CAGR during the forecast period. Based on type, the services segment of the market is projected to grow at the highest CAGR from 2018 to 2023, owing to the increasing requirements of clients for processing the pre, post, and integration phases involved in the implementation of product stewardship solutions. These services help in driving the productivity and efficiency of business processes, thereby enabling businesses to build a time-efficient system. Based on organization size, the large enterprises segment is expected to lead the product stewardship market in 2018. Based on organization size, the large enterprises segment is projected to lead the market from 2018 to 2023. The growth of this segment can be attributed to the affordability of large enterprises to adopt product stewardship solutions and services and their high economies of scale, thereby allowing them to leverage the benefits of these solutions and services. Companies spend significant amounts in shifting their tactical marketing techniques to sustain their position in the highly competitive market. The market is undergoing significant technological transitions in the form of personalized marketing, Big Data, social media, real-time solutions, and increased use of mobile devices. The North American region is expected to lead the product stewardship market in 2018. The North American region is expected to lead the market in 2018. Stringent government laws and regulations related to the use of Environment, Health, and Safety (EHS) solutions for environmental sustainability are driving the adoption of product stewardship solutions and services in the North American region. Moreover, the presence of some of the key players of the market in the region is also expected to drive the growth of the market in the North American region. Key players such as Enablon (US), Enviance (US), Gensuite (US), ProcessMAP (US), SiteHawk (US), Sphera Solutions (US), VelocityEHS (US), and Verisk 3E (US), along with several start-ups are offering enhanced product stewardship solutions and services to cater the requirements of their customers. The major factor expected to hinder the growth of the product stewardship is the inability of enterprises to keep track of regulatory changes related to product stewardship solutions and services. Key market players profiled in this report include Verisk 3E Company (US), Enviance (US), CGI (Canada), Enablon (US), Gensuite (US), SAP (Germany), thinkstep (UK), UL Wercs (US), Sphera (US), ERM Group (UK), Enhesa (US), ProcessMAP (US), SiteHawk (US), Velocity EHS (US), Intelex (Canada), Cority (Canada), Anthesis (UK), Covestro (Germany), Pace Analytical (US), Wood Group (UK), Phylmar Group (US), Yordas Group (UK), Scout Environmental (US), Arcadis (Netherlands), and Young and Global Partners (Belgium). 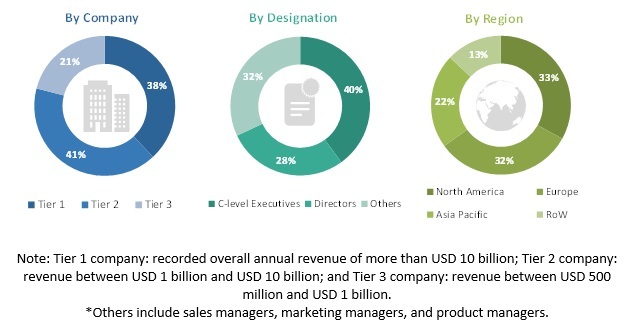 These players have adopted various growth strategies such as partnerships, agreements, and collaborations; and new product launches & product enhancements to further expand their presence in the product stewardship market and broaden their customer base. In December 2018, ERM Group launched ERM Nexus, a new technology platform designed to streamline and enhance the way it delivers projects across the globe to provide fast, improved, and safe outcomes for its consumers. In November 2018, Sphera Solutions signed a go-to-market agreement with Yokogawa Electric Corporation (Japan). Started on December 3, 2018, Yokogawa is expected to offer risk assessment and consulting services of Sphera for plant facilities. In May 2018, Verisk 3E expanded its presence by opening a new office in Beijing, China. In February 2017, Cority acquired regAction, an environmental compliance management software provider. What are the growth opportunities in the product stewardship market? What is the competitive landscape scenario in the market? What are the regulations that are expected to have an impact on the market? How have product stewardship solutions evolved from the tradition risk and compliance solutions? The study on the product stewardship market involved 4 major activities to estimate its current market size. Exhaustive secondary research was carried out to collect information on themarket. The next step was to validate these findings, assumptions, and sizing with the industry experts across the value chain of product stewardship solutions and services using primary research. Both, top-down and bottom-up approaches were employed to estimate the overall size of the market. Thereafter, the market breakdown and data triangulation procedures were used to estimate the size of various segments and subsegments of the market. In the secondary research process, various secondary sources such as Hoovers, Bloomberg BusinessWeek, and Dun & Bradstreet were referred to identify and collect information for this study on the product stewardship market. These secondary sources included annual reports, press releases and investor presentations of companies, whitepapers, certified publications and articles by recognized authors, gold standard and silver standard websites, regulatory bodies, trade directories, and databases. Top-down and bottom-up approaches were used to estimate and validate the size of the product stewardship market and various other dependent submarkets. While using the top-down approach, an exhaustive list of vendors offering product stewardship solutions and services was prepared. The shares for these vendors in the market were estimated through annual reports, press releases, investor presentations, paid databases, and primary interviews. Each vendor was evaluated based on solutions and services offered by it based on type, organization size, and region. The aggregate of revenues of all companies was extrapolated to reach the overall size of the market. Each subsegment was studied and analyzed to obtain its market size and estimate its regional penetration. The markets were triangulated through both, primary and secondary research. The primary procedure included extensive interviews for key insights from the industry leaders such as Chief Executive Officers (CEOs), Vice Presidents (VPs), directors, and marketing executives. After arriving at the overall market size using the market size estimation processes explained above, the market was split into several segments and subsegments. The data triangulation and market breakdown procedures were employed, wherever applicable to complete the overall market engineering process and arrive at the exact statistics of each market segment and subsegment. The data was triangulated by studying various factors and trends from both, demand- and supply-side. Following vendors were covered in this report on the product stewardship market, which include 3E Company Environmental Ecological and Engineering (Verisk 3E Company) (US), Anthesis Consulting Group (Anthesis) (UK), Arcadis (Netherlands), CGI Group Inc. (CGI) (Canada), Cority (Canada), Covestro AG (Covestro) (Germany), Enablon France SA (Enablon) (US), Enhesa (US), Enviance (US), ERM Group, Inc. (ERM Group) (UK), Gensuite (US), Intelex Technologies (Intelex) (Canada), John Wood Group PLC (Wood Group) (UK), Pace Analytical Services, LLC (Pace Analytical) (US), Phylmar Group (US), ProcessMAP (US), SAP SE (SAP) (Germany), Scout Environmental Inc. (Scout Environmental) (US), SiteHawk LLC. (SiteHawk) (US), Sphera Solutions, Inc. (Sphera) (US), thinkstep AG (thinkstep) (UK), UL (UL Wercs) (US), VelocityEHS (Velocity EHS) (US), Yordas Limited (Yordas Group) (UK), and Young & Global Partners (Young and Global Partners) (Belgium).